Please note: Things change so fast in Connecticut that this information may no longer be accurate. From the beach cottages that line the shore to the breathtaking sunsets, you really should take the time to visit Milford, CT.
On these pages we'll try to show you a little of these secret spots along with some places to stay and restaurants to eat. Milford Connecticut is really a nice place to visit. Sometimes when we travel through Milford, like on Boston Post Road, we groan because it is so commercial now, but on the other hand, there are now lots of places to go shopping now. But there are also areas of Milford that have breathtaking views, old historic homes, and scenic landscapes that make us wonder if we're still in Milford, because it's a view that very few travelers see. The Milford downtown area has undergone some changes, especially by the waterfront. 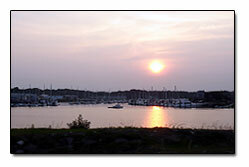 They have built some condos there, and the Milford marina is a great place to take a stroll or fish. There is also a fantastic rose garden at the marina. A romantic stroll over a small bridge will open your ears to the rippling of a waterfall. 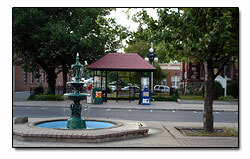 Milford also has some very nice scenic parks, and several times we have seen weddings take place in these parks. While we can't include everything that we take pictures of in Milford, these pages will give you some idea of what it is like to visit or vacation here. Enjoy your visit! Visit Ansonia - A small town located in the Naugatuck Valley, not a huge town, but a great place to do some antique shopping. Visit Shelton CT - The town where we live, looked at from a historical perspective. Visit Stratford CT - Stratford is along the shoreline, but only has one shoreline motel. Exciting NY - View pictures of our trips to New York. Riding the doubledecker bus. What fun!